Fiber is an indigestible yet essential part of a healthy diet. It can be either soluble or insoluble. Soluble fiber forms a gel, slows down digestion and may be very helpful in keeping cholesterol at healthy levels. Insoluble fiber helps regulate the digestive system, preventing constipation and other digestive upsets. It passes through the digestive tract more quickly than soluble fiber. A common side effect of a high-fiber diet is intestinal gas, or flatulence, a by-product of the action of intestinal bacteria on dietary fiber. Foods high in insoluble fiber are less likely to cause this problem than those rich in soluble fiber because they move through the tract quickly, allowing bacteria less time to produce gas. Add fiber to your diet gradually and consult a doctor to develop a dietary plan suitable for you. Products made with whole grains are high in insoluble fiber and very healthy foods. Because their fiber is processed by the gastrointestinal tract quickly, they are unlikely to cause noticeable bloating or gas. 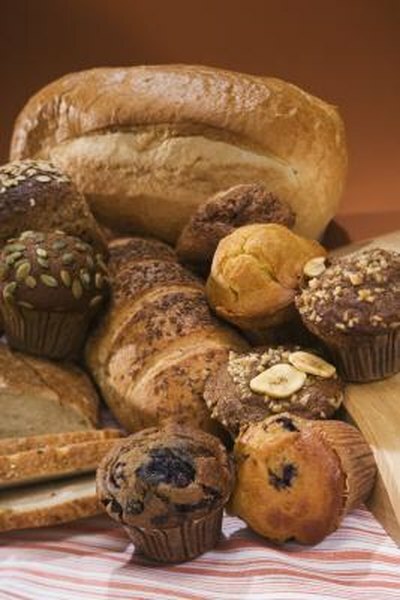 Whole wheat breads, baked goods and cereals are very beneficial and good examples of these foods. Choose whole wheat pasta over white pasta and substitute brown rice for white rice when planning meals. Increase fiber by adding wheat bran to sauces or sprinkling it on cooked foods. Most vegetables are good sources of fiber, but some may cause gas. However, those high in insoluble fiber are less likely to cause this problem. Good examples of vegetables with lots of insoluble fiber are corn, carrots, parsnips, tomatoes and zucchini. Avoid most legumes, such as beans and lentils, to minimize gas, since these vegetables have lots of soluble fiber. However, peas are an exception among the legumes; they are fiber-rich, but the majority of their fiber is insoluble, making them good choices to minimize gas and bloating. Certain fruit is less likely to cause gas than other types. Blackberries and cherries, for example, have about 2 to 3 times as much insoluble fiber as soluble fiber. Other good choices to maximize insoluble fiber are pineapple, pomegranates, and apples with their peel consumed along with the flesh. Bananas also have more insoluble fiber than soluble fiber, as do pomegranates and strawberries, making them good, high-fiber foods that are not likely to cause gas.